Home » Pregnancy » 1st Trimester » Molar Pregnancy – What is it and Why Does it Happen? A molar pregnancy is a rare abnormality which is caused at conception — that moment when the sperm meets the egg. 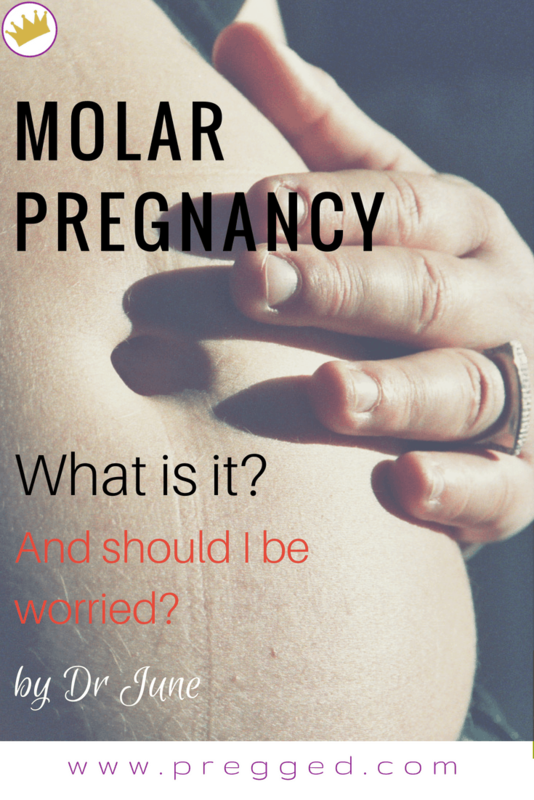 But what exactly is a molar pregnancy? Molar pregnancies are also called ‘GDT’, which stands for Gestational Trophoblastic Disease. They happen because of an extra chromosome in the male sperm and/or an empty female egg at fertilization. As a result, placental tissue grows very quickly in the uterus, forming a large mass — or ‘mole’ — that looks like a bunch of grapes. It’s rare for an embryo to exist at the same time; and when there is an embryo, it cannot survive or develop into a baby. There are extremely few exceptions when an embryo does develop and survive into the late weeks of a molar pregnancy. No. Molar pregnancies occur in only 1 in 1,000 pregnancies in the U.S., and women who are younger than 20, or older than 35, are at slightly higher risk. In addition, a low intake of Vitamin A and ongoing health issues including Polycystic Ovary Syndrome (PCOS) raise the risk of molar pregnancy. Because of the rarity of this pregnancy abnormality, many people aren’t aware of it at all until they experience it themselves. That can make it difficult to talk about if it does happen to you. If you’re going through a molar pregnancy (or have had one recently) and are struggling to talk about it with the people close to you, you could start by sending them this article. It can help to know that your loved ones know what’s happened, and understand that it’s an emotionally upsetting experience which often causes genuine grief. It’s difficult to detect a molar pregnancy on your own because the symptoms are very similar to normal pregnancy symptoms. This is because during a molar pregnancy, the placental tissue growing in the uterus produces high levels of the pregnancy hormone hCG. This is the hormone that home pregnancy tests pick up — so you will get positive pregnancy tests if you have a molar pregnancy. If the molar pregnancy has progressed to 15 weeks or more without yet being detected by your doctor, midwife or sonographer, you may find out as a result of not feeling your baby move when you would expect to. It’s unusual to get to this stage though. A molar pregnancy is often first discovered during the first scan, between 11-13 weeks — on the sonogram, the grape-like appearance of the abnormal placenta is visible. What is a complete or partial molar pregnancy? A complete molar pregnancy forms when the sperm fertilizes an empty egg. There is no embryo at all in this kind of molar pregnancy — only the placenta grows, and produces hCG. An ultrasound scan will show that there’s no baby. A partial molar pregnancy occurs when the growing mass of tissue in the uterus contains both the abnormal placental cells and an embryo which has severe defects. The embryo’s growth will quickly be overtaken by the placental growth, and it is highly unlikely to survive for very long. The tissue mass that grows in the uterus during a molar pregnancy is usually benign (not cancerous). But in extremely rare cases, the cells can be malignant (cancerous). Even when there is a cancerous growth, it is straightforward to treat and removal of the tissue is likely to be successful. It’s important to go to each follow-up appointment after the removal of a molar pregnancy, as your doctor will make sure that no tissue has been left behind or regrown. If any of the mass has remained in the uterus, it can then be removed to prevent the risk of it becoming cancerous. What happens if you find out you have a molar pregnancy? Most molar pregnancies will end on their own, with bleeding and the loss of tissue which looks like a cluster of grapes. Often that’s when women first realize that they’ve had a molar pregnancy. If the pregnancy continues beyond the first few weeks and is detected by an ultrasound scan or other examination by an Obstetrician or Midwife, treatment may be needed to remove the abnormal tissue. In this case, you would be referred to specialist care. Molar pregnancies can be removed in a number of ways, including surgery by ‘dilation and curettage’ (D&C), or with medication — similar to a medical termination. Roughly 90% of women require no further treatment once their molar pregnancy has been removed. But follow-up appointments will be necessary to check that hormone levels are returning to normal and that no traces of the abnormal tissue have remained in the uterus. It is advised that you use birth control to avoid becoming pregnant again for one year. Although there may never have been a live embryo in your uterus during this form of pregnancy, remember that it’s still a difficult thing to go through emotionally. You believed you were going to have a baby, and finding out that this isn’t the case is often distressing. Seek advice from your medical care team if you’re struggling; they can refer you to a counselor who’s experienced in talking with women who go through abnormal pregnancy experiences and baby loss. And if you can, let close friends or family know that you need some extra support.